”One-crocoBANG”. Counting the seconds between the flash of lightning, and the clap of thunder, on an exposed ridge between Malealea and Roma, had suddenly become less than fun. In fact, perched on an aluminium mountain bike, or conductor, call it what you will, a more accurate description would be life-threatening. Our adventure had started six days earlier, when my partner for the Lesotho Sky, Jakes Jakobsen, and I crossed through the Van Rooyens border post onto the billiard-table-smooth tar that would take us to Maseru, and eventually Roma. The trip up from Cape Town is a long one, so as soon as we found the Roma Trading Post, we dropped our bags, unpacked the bikes and set of on a pre-race exploration ride. On the other side of Roma we encountered our first taste of what was to come over the next week, an unnamed pass (to us it was of Alpine proportions, as our legs and lungs screamed for more oxygen at 1800m) that took us up to an area with some spectacular slick rock riding. To mountain bikers, this stuff is manna. Both Jakes and I have ridden in Moab, in the USA, and after a few minutes playing here, seeing more and more of it unfold as we crested each ridge, we already had plans in our heads of selling up and building uber-trails… this was also our first interaction with the people that live here, and very quickly we categorized them into two distinct groupings: over about five-foot tall, our rudimentary ‘dumela’ was returned with the broadest of grins and chit-chat (unfortunately, that was the limit of our ability to converse, so we, too, relied on smiles). Under five-foot, and before we had a chance to greet, the plea for sweets would tumble out of little mouths. Again, although this was in English, that was pretty much the limit, and this became the pattern, certainly in the foothill riding we were to do in the next few days. At times, it was an annoyance, but that was generally only when we were so tired we could only ride at walking pace, so the irritation value of small legs trotting next to you, effortlessly, was at defcon 12. Mostly, it was just a greeting. The ride back to the Trading Post was perfect as a leg-loosener for the next day’s first stage, which was laid out for us by the event directors, Darol Howes and Christian Schmidt, at that evening’s race briefing. 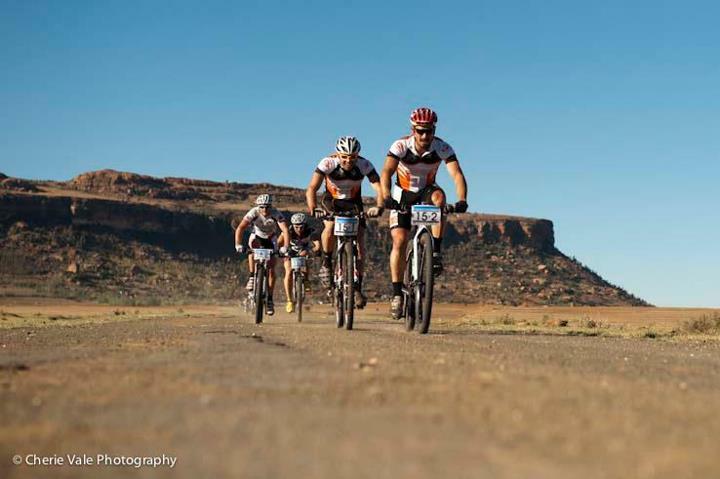 It was our first experience of their particular brand of what-you-don’t-know-won’t-harm-you, a quality all race organisers possess when faced with telling their riders the truth about an upcoming route: “it is all downhill from the second waterpoint”. Day one dawned bright and chilly. Very chilly. Two degrees chilly, in fact, and we immediately blamed this for the way we felt from the start. In reality, we just couldn’t breathe at 1800m, and gasped our way through the 48 kilometers in around four hours. The route, as a first taste of riding in Lesotho, was spectacular: after a nasty climb and some bumpy ploughed fields, we climbed up onto the ridge overlooking the Roma valley. In the far distance we could see some proper mountain peaks but, sensibly, we ignored them and focused on the trial at hand. Which was negotiating the all-downhill finish. To be fair, it was mostly downhill, although there was an early taste of the rocky descents we would face in the higher mountains, but the sting in the tail – a tiny climb back up to the Trading Post, and a cold beer, was a little rude. But quickly forgotten as we sat around and compared notes. The general consensus was that we were in for a fun week. Day two was a little warmer, but the start of the stage was identical to day one. If anything that first nasty goat track had got steeper and longer. The goats even laughed at our lack of talent, ringing their bells in disdain. Our destination was the Molengoane lodge, 66km away as the route-designer’s pen flew, and if we were blown away by the scenery on day one, today we got to add even more of the friendly locals to the mix. 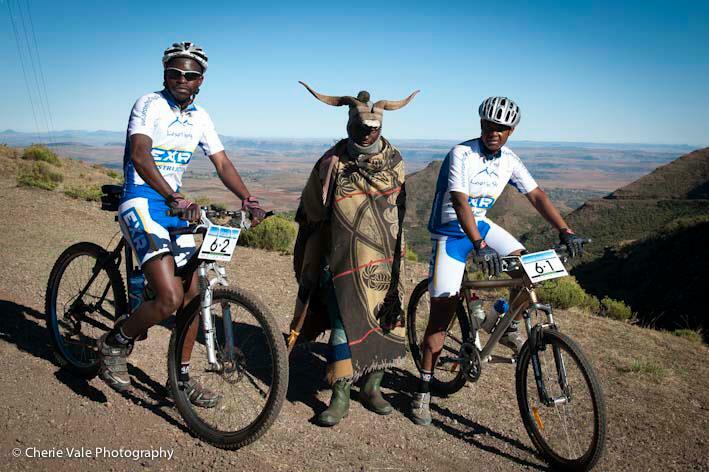 Legs and lungs were still working at sea level values, but we had time to admire Qiloane, the koppie that inspired the Basotho hat that symbolizes the nation, as we rode past. The final 20 kilometres was a bit harder than the terrain suggested, courtesy of an irritating headwind, which was irritating if you were from the Cape, and gale-force if you were from up-country. These winds would be a pattern over the next few days, picking up in the mid-morning, but more often than not as generous tail winds. The nightly pre-race briefings had, already, become something of a traditional why-don’t-we-trust-you session, as Darol would put up an image of a route, with a spiky altitude profile, and then lie his their teeth about its severity. Day three was a fine example. Bushmen’s Pass is an iconic stretch of the annual Roof of Africa motorbike rally, and is the final test for the Silver-class finishers. It is a kilometer and a bit of near-vertical mountain, with the path just about discernible. It was brutal, an hour of trudge with your bike draped over your shoulders. How the guys get their 100kg motorbikes up here boggles the mind, but they do, and we did, and the reward was a spectacular technical downhill that caught a couple of riders out, before we spilled out onto a smooth rolling road through a hauntingly remote valley. The Three Witches climb was next, a brute of a road. On tired legs, I will admit this was not much fun, and even less so when a friendly hoot announces boxy ‘80s Toyota Cressida bumping and rattling past you, on an ascent you would think twice about tackling in your suburban softroader. 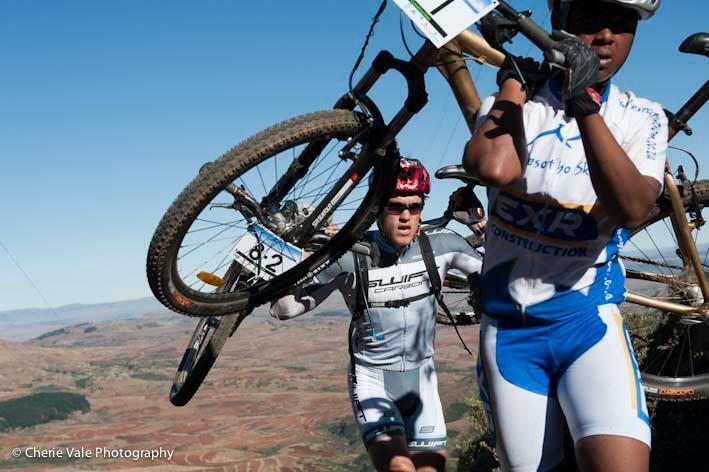 After a swift descent, we found water point two, where Darol had hidden out, fearing backlashes at the top of Bushmen’s. Today, though his face was less than cheerful, as he informed us that the stage had been neutralised, as there had been a road accident with one of the crew vehicles. 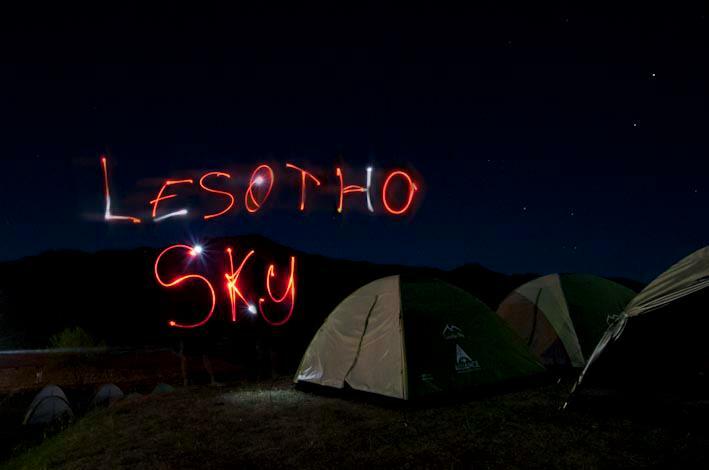 Three crew members were in hospital with serious injuries, and a fourth, a local journalist who was creating the Lesotho Sky photo-essay book, Liepollo Rantekoa, had died on the scene. The final run in to the Ramabanta Lodge, which would host us for the next two nights, featured a miserable climb on a road that was being prepared for tarring. Fatigue, construction vehicles and a heavy heart conspired to make the entry to Ramabanta miserable and sore. That such sadness could cloud such a beautiful place seemed unbelievable, and the evening proceedings were, as you can imagine, somber. One of the driving forces behind this event is the former Lesotho ambassador to Germany, Dr Makase Nyaphisi and he addressed us on behalf of Liepollo’s family, with whom he had spent the day, and asked us, with the King’s blessing, to continue with the event in her honour. This event is held in high regard here. 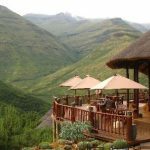 Ramabanta is another happy hunting ground for the Roof, and from the lodge we could see what lay in store for us on day four: the infamous Baboon’s Pass. Unfortunately, to get into the valley that becomes Baboon’s, Darol insisted we kick off the day with a 25 kilometre climb. Some would call this unnecessary. But it was there, so we did it – an unrelenting grind up a wide, boring district road took us to 2870m above sea level. The Unhappy Bunnies club was hiring. And continued acquiring members as Darol’s promised “it’s all downhill from the waterpoint at 26 kays” was another fancy. To his credit, he had steered us down one of the most beautiful places I have ever ridden a bike. Rugged and rocky, much of the early going was on foot, but with snow just a few hundred feet above us, and views for miles in all directions, any complaints quickly disappeared. The descent, once we had negotiated the rockier upper reaches, was the highlight thus far. 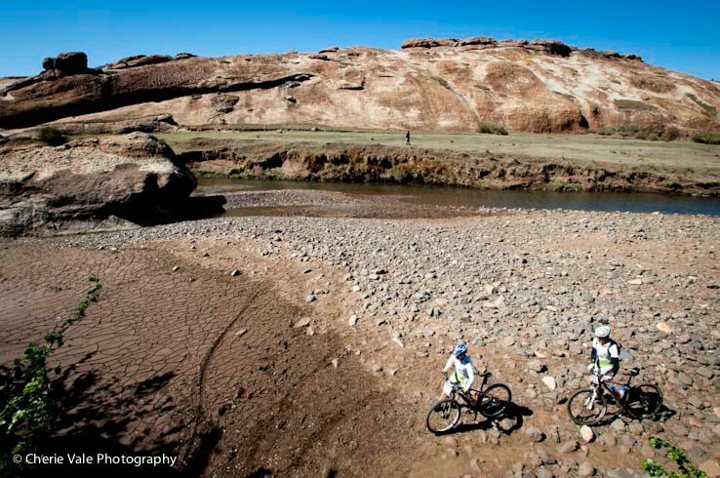 Singletrack, jumps, river crossings and muddy rocks, it eventually opened out into a fast final few kilometres that left all of us with aching hands and fore-arms. And big, big smiles. The 51 kilometres took a little over four hours, and we enjoyed almost half of it. With a final day of over 90 kilometers on the cards, the goal with day five’s 68 kilometre stage was to conserve a little energy. Of course, as soon as the starter’s gun was fired, the plan was shredded, as the first 20-odd kilometres followed the edges of the Makhaleng river. We had bridge crossings, singletrack, rocky climbs, hairy descents (Jakes attempted to emasculate himself using just a handlebar, on camera, on one of them – there are videos of each stage on the Ride website www.ride.co.za), all in all, far too much good riding to not have fun. But fun costs, and the final climb of the day was brutal. It was hot – mostly, we had been riding in the mid to late twenties all week, but now it was over thirty, and as humid as hell. And as we finished, the clouds started rolling in, treating us to a crashing thunderstorm. It was as if the mountains were trying to remind us this was their territory, not ours. The final day promised to be a cracker. We had all but overcome the altitude issues that had robbed us of oxygen, and pleasure, for the first few days. We had all forgotten the thunderstorm by morning, and when one of the local Lesotho riders, Sello, told us on the startline that we were going to get lashed today, we presumed he meant physically, by him, on the bike. He quickly set us straight: he menat by the rain. For the first hour and a half we were treated, again, to spectacular mountain biking against the dramatic backdrop of en ever-darkening sky. As we climbed up from the first waterpoint, the temperature dropped to nine degrees, and as a drop or two of rain began to fall, we stopped and suited up. With more than 50 kilometres to go, we were playing it sensible. As we ascended up to the high point of the day, we left the last village we would see for a few hours, and began a ride along the an exposed ridge. The heavens opened, and the temperature plummeted to just four degrees. Wearing only lycra shorts and a thin racing cape, we knuckled down (technically, not really, they were too frozen to be of any use) and just kept moving and eating, to keep our bodies warm. Stopping would have been lethal, something I pointed out to Jakes as the thunder and lightning got a bit closer. Better to die in a blaze of electric glory, than to shiver to death on a mountain. He followed my advice, and we scurried on, counting the seconds between crash and flash as we did. We raced off that mountain like scalded cats, happy and relieved, but there was more in store. The second thunderstorm hit at the 60 kilometre mark. This time Christian appeared from the mist and directed us to a crowded cowshed, where the rest of the soggy race had been corralled. The race had been called off, a sensible decision in the circumstances, but a little disappointing at the time, as we were beginning to enjoy being the most stupid people on the planet. Huddled in this shed was a fitting end to our Lesotho experience, as it didn’t take long for the local folk to come over and start handing out their own blankets for us to warm up in. They even brought over a heater. As other rides trickled in, we heard stories of seeking cover in small villages, and being herded into warm huts, while the hosts stood outside in the cold so there was room inside. And these were the lasting impressions of this magic event – over and above some of the best riding I have ever encountered, the local friendliness and generosity was beyond anything we expected, a hallmark of this incredible event. You can download the final official results here.